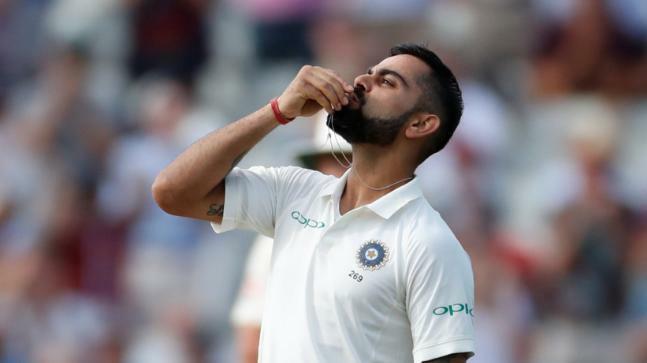 Virat Kohli the best batsmen in the planet has scored his 1st test hundred in England and 22nd of the total in his career, India’s response was single-handedly taken by him to host first innings 287 all out in the first test at on Thursday at Edgbaston, England. Against England it was his fourth century in test cricket, the rest of the previous three centuries was scored in India. Virat Kohli is the second player from Indian to scored his century in his first test innings in England, as a captain. Other them him Mohammad Azharuddin has scored 121 in 1991 as a captain. Kohli has also scored twin hundred in this debut test match against Australia at the Adelaide, Oval in 2014. Kohli’s hundred at Edgbaston was under a very interesting situation. He was appealed by the wicketkeeper when is score was 97. Ishant Sharma was the 9th wicket to fall with him at 97 runs. There was a large appeal for a catch behind the wickets, Ben Stroke was spelling the ball. Only Jonny Bairstow seemed interested Ben didn’t even go for the appeal. Kohli Scored his hundred in the fifth ball of Ben Strokes over by hitting a boundary. Which led him to bring his maiden test century in England. And he dedicated his hundred to wife Anushka Sharma. She also has given a recent super hit movie Sanju at the box office. Virat has scored 149 runs and was the last man to fall for India, where he has decorated with 22 fours and one six. England innings ended with Mohammed Shami took Sam Curran. Murali Vijay and Shikhar Dhawan started the reply on strong note adding 50 runs partnership in the opening wicket. However, Ben Stroke and Sam Curran ripped through the middle order and started falling apart. Kholi is much-improved batsman now. Long back he has managed to get 134 runs in five test on the horror tour of 2014. He gave a spirited fight back. Four years ago, after the 1-3 series defeat in England, he has got a drastic improvement in his game. He has scored 15 test hundreds including six double hundreds and scored runs all around the world including South Africa, West Indies, and Australia. James Anderson laugh off when Kohli said,” I didn’t matter whether I got runs or not as long as India won. He determined to make amends on this tour. Anderson said Kohli is lying if he thought his runs would not make a difference to the Indian Team. And that’s exactly what happened on Thursday all the players got failed. While Hardik Pandya was the only batsman apart from Kohli who was fighting the English bowlers. He and Kohli have scored 48 for the sixth wicket of India. It was a complete Virat Kohli show. England was the only country where he had played many tests but failed to score a hundred. On Thursday, he eradicated that record added his new record at Birmingham. This was a different Kohli show. For More Updates on Cricket News and Cricket Match Prediction press the red bell icon.